Makeup Artists of Kent State plan to celebrate Black History Month at their meeting at 7:30 p.m. on Feb. 23 in Bowman room 137. Makeup Artists of Kent State gives makeup enthusiasts a place where they can share their love for makeup, share their knowledge and learn more, according to club member Meg Spisak. Information and product giveaways of black-owned makeup brands will be provided at this meeting. For those more skilled in makeup, there are chances to apply as a freelance team member. Members in this position work with different associations around campus in need makeup application skills. Organized by the club’s board members, the meetings are open to all. 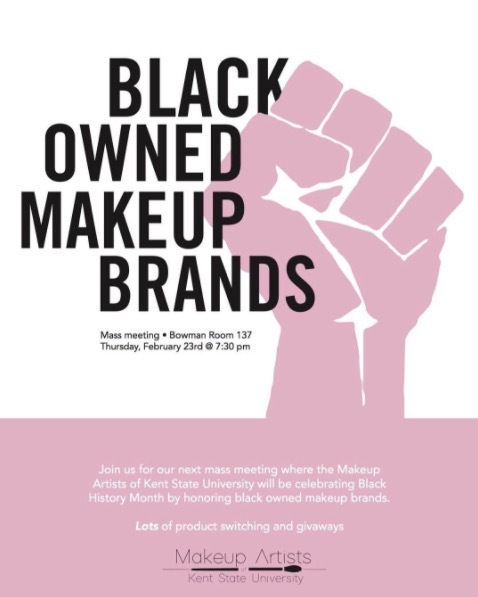 Any information you have of black-owned makeup brands can be brought to this meeting in preparation for discussion. The meetings usually run one hour long. For more information, you can find Makeup Artists of Kent State at their Twitter and Instagram, @muakentstate.